From left to right are Gallia Commissioner Harold Montgomery, Gallia Sheriff Matt Champlin, Gallia Commissioner Brent Saunders and Gallia Commissioner David Smith. 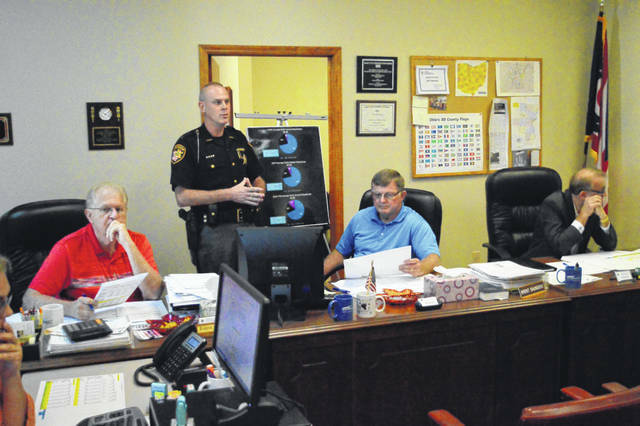 Montgomery stated at one point during the course of the Gallia Commissioner Thursday meeting that commissioners were estimating potentially over 50 percent of Gallia’s general fund would be spent on criminal justice issues by the end of the year. GALLIPOLIS — Gallia Commissioners invited the Gallia law enforcement community to its regular Thursday morning meeting to discuss concerns with the growing costs associated with county corrections issues and a growing inmate population. Those attending included Gallia Common Pleas Judge Margaret Evans, Gallipolis Municipal Judge Eric Mulford, Gallipolis Police Chief Jeff Boyer, Gallipolis City Manager Gene Greene, Gallipolis City Commissioner Tony Gallagher, Gallipolis City Solicitor Adam Salisbury, Ohio State Highway Patrol Gallipolis Post Commander Lt. Barry Call, Gallia Prosecutor Jason Holdren and Rio Grande Police Chief Josh Davies, among others. Commissioner Harold Montgomery said he agreed with his colleagues. Montgomery’s statement about “defense of the indigent” refers to the county’s responsibility to fund an attorney for a defendant’s counsel, if that individual cannot afford an attorney. Montgomery thanked the region’s judges because he felt that sometimes others did not understand the efforts they have taken to divert defendants into rehabilitation or other such programs to keep them out of “our jail situation,” he said. Next, Gallia Sheriff Matt Champlin presented statistics over the last three years regarding the Gallia corrections program, including the jail and Gallia Work Release Center. In 2016, the county housed 1,655 individuals through its jail, 560 through the work release center and 83 for out-of-county. In 2017, 1,884 were housed in the jail, 558 in the work release center and 149 out-of-county. In 2018, with year-to-date totals, 1,639 were housed in the jail, 440 in the work release center and 273 in out-of-county facilities. Total expenditures for the county jail expenses in 2016 totaled $1,536,153,76 with $157,266 of that in out-of-county housing for inmates. In 2017, the county spent $1,635,780.08 on its jail program with $318,359 on out-of-county inmate housing. In 2018, The county spent $1,586,995.53 on jail with $461,532 on out-of-county housing. In 2016, out-of-county expenses cost $104,048 in prisoner housing, $5,196 in medical and $48,020 in transportation. In 2017, housing cost $214, 892, medical cost $11,855 and transportation cost $91,610. In 2018, housing cost $353,580, medical $25,299 and transportation $82,653. Champlin said he wanted those present to understand that the 2018 totals were measured through the end of August. Bills had not been received for the month of September yet. The Gallia Jail is reported to be a 22-bed facility. Champlin said while law enforcement was doing its job, higher numbers of inmates presented challenges. Smith said the Gallia general fund is roughly $8.6 million in 2018. Commissioners anticipate they can maintain expenses through 2019 but are concerned about the coming years due to the loss of roughly $600,000 annually in what has been called an MCO sales tax loss due to recent rulings by state government. Commissioners said Gallia was not unique among other rural counties in its financial, jail and opioid problems, but that they had gathered with the law enforcement community Thursday to get solutions in motion. Gallipolis City Manager Gene Greene asked the commissioners if the county was looking down the road to a “centralized jail” or added revenue to help the issue. Smith said no possibilities were being “closed out.” As for a regional jail, he mentioned concern with examples of regional jails across the river in West Virginia and their challenges. He said he had heard talk that state officials may be considering jail funding to be included in the state’s capital improvement budget, but that local government would have to wait and see what happens.